For the past year, I’ve been looking for a Canadian perfume brand, or a Canadian perfumer to write about. I’m not a big fan of Lise Watier and her Nieges scents, or any of her other scents, and there wasn’t anyone or anything else jumping out at me. A few weeks ago, I pulled my head out of my posterior and realized that Ayala Sender, the SmellyBlog scribe, was the nose behind Ayala Moriel Parfums in Vancouver BC. I “friended” her on Facebook and started following her feed. A thorough perusal of her Web site lead me to place a sample order, and since it showed up on Tuesday, I’ve been in constant swoon mode. I’ve long been impressed by the talents of Serena Ava Franco, Mandy Aftel, and Dawn Spencer Hurwitz; now, I am so happy to have discovered Ayala. Bois d’Hiver: Notes of incense, spices and fir make this the perfect holiday scent. It has a cinnamony freshness, with a slight bit of incense hovering about, and the brisk green of fir in the background. Bois d’Hiver is a testament to Ayala’s skill, because the scent is simultaneously warm and spicy, yet has a definite freshness I find so uplifting. Bon Zai: This is “zen” in a bottle. And goodness knows I’ve been needing some. Shiso leaf and agarwood combine for another crisp, yet warm composition that is both zingy and woody. It reminds me faintly of a good Earl Grey tea, but with more depth and warmth. Cabaret: When I saw the words, “Rahat Loukhoum” used to describe this scent, I knew I had to sample it. Serge’s Rahat Loukhoum is one of my all time favourites, and Ayala’s Cabaret is far less gourmand than Serge’s, with more rose and a bit of powder peeking through. There’s a tad too much rosewater in here for my comfort level, but it would make a lighter alternative to the heaviness of Serge in warmer weather. Although I did find myself dipping into Serge’s Rahat in the height of the heat last summer. That just goes to show you how much I love a good gourmand! Épice Sauvage: If love the deep, dark woody spiciness of a scent like Donna Karan’s Black Cashmere, this one is for you. I like to call a scent like this a “bear hug” because it envelops you in its warmth and spiciness the way a heartfelt hug from a loved one does. You can’t go wrong with atlas cedar, cardamom and honey. Espionage: Arrest me and hang me for high treason. This combination of scotch, leather and cigar smoke dries down to a smoky, musky vanilla that is just sublime. I thought the cigars my cousin Simon brought back from Cuba a few weeks ago were the best things I smelled in a long time, but Espionage wins by a couple kilometeres. Film Noir: I’m very, very, very picky about my patchouli, and this is one of the few I am willing to wear. Dark chocolate and myrrh accompany the patch and the drydown is yummy. This isn’t a dirty, skanky patchouli, rather one that is earthy, loamy and almost green. The dark chocolate compliments it really well, and myrrh adds just a touch of sweetness. Finjan: This one reminds me of the Wood Coffee scent from Comme des Garçons defunct Sweet series. This is a spiced Turkish coffee gourmand that’s not as sweet as Wood Coffee was, but it has a bit of floral in the background that makes it very interesting. I also get a good bit of cloves and probably some cinnamon; very warming and comforting. Immortelle l’Amour: There is never any mistaking the sweet maple-y smell of immortelle. It just depends if you like it sweet, or not. This is a sweet immortelle because it’s mixed with vanilla. So, if you’re an Annick Goutal Sables lover, you might not like this one. It’s got vanilla in it, so I’m down; there’s also some rooibos in here that gives it an herbal tinge. Speaking of herbal, Ayala offers this as a scented tea as well. My sample package from Ayala was definitely the highlight of my week. Taking this short journey through her fragrant word has left me wanting more – more of what I’ve already smelled, and more of what I haven’t. Much as I love a good department store scent, or a fragrance from one of the more well-known noses we love, making this type of a discovery reminds me why I love fragrance so much. Perfumers like Ayala, Serena, Dawn or Mandy can leave you gobsmacked when you smell their creations. I needed a little gobsmacking, and I am so glad I found it in the form of fragrance. Ayala Moriel is a new-found treasure. To learn more, visit her Web site, Ayala Moriel Parfums. Disclosure: I purchased an 8 scent sample pack directly from Ayala’s Web site. I have trouble receiving mail from Canada so I haven’t tried more of Ayala’s splendid perfumes. My personal favorite is Rebellius! Good to see you, Nava! I see a sample pack in my future…I remember trying and admiring Espionage a while ago…but the Bois and Sauvage sound marvelous. Hugs to you and Happy Weekend to All! Espionage is wonderful. So are the Bois scents. So is everything I sampled! Hugs back and you have a lovely weekend, too! I bought a sample pack a couple of years ago and loved it. I wish that I could remember everything that I tried, but the one that stands out in my memory was InCarnation, a spicy carnation soliflore. As with many other people, I find that naturals fade quickly on me, so the price becomes very high based on the amount that I use when I wear them. InCarnation actually had both decent sillage and good lasting power. I don’t think that I’ve tried Espionage, but your description makes it sound very tempting. Did it last on your skin? Espionage and Film Noir were the two longest lasting scents. They each lasted a good 8 hours. Her creations come in extrait and oils. If I end up placing an order, I will most definitely order the scents in oils. Unfortunately, steep prices on these natural perfumes keep me away. $50 for 8 1ml samples? Ouch!!! In contrast, I just purchased 20 1ml samples of the complete Rosine line direct from their website for $26 U.S., PLUS free shipping! I don’t understand offering sample-sized vials for a high price. Samples are meant to lure you into a fragrance line. They should be offered at a nominal price, or for free! If the ingredients are just too precious to offer them at a low price, then drop the ml amount. I’ve had lots of experience with natural perfumery, so it’s a matter of knowing what you’re getting. Sampling has become a necessity with the skyrocketing prices of fragrances. Just take a look at LuckyScent’s offerings; there isn’t much under $100.00 these days, so for me, a smattering of 8 for $50 is not that big of an investment. In terms of amount, 1 ml is more than you think! Sephora has popularized that sample pack/bottle credit deal. Shoppers Drug Mart is doing it as well, charging $75 for a box of samples redeemable for a full-size bottle. “Pick your poison” is the M.O. here – I could easily redeem that for a bottle of Cashmere Mist in one of their stores! Ineke is one high-quality niche perfumery that does it right — $25 for generous samples of the whole line, and you can redeem that against the price of a full bottle. Nice! Thanks, Cathy! I just ordered a bottle of Field Notes from Paris – Christmas gift for my husband. I requested a sample of Evening Edged in Gold, which Ineke is going to send me. Didn’t realize they offered redemption with purchase of the sample set. Hmmm…I may have to check that out! Also, Teo Cabanel offers 1.5ml samples of all of their five fragrances for 5 euros plus free shipping! Thanks, ladies, for all this good info!! Hi Nava, lovely post. I have been thinking of you and hope you are doing well. Thanks for sharing about Ayala; I’ve heard of her but have not tried any of her scents. And being a tea fanatic, my ears perked up at the mention of her tea. Thanks and have a great weekend! I don’t know if she still makes it, but she has/had a fragrance called Green Tea that was/is lovely! Wait. I got confused. It’s AVA LUXE that has the Green Tea. Yes, A – Serena’s green tea scent is pretty amazing. Check her site – she’s got lots on there now. Hi Nava, I think Cabaret is beautiful. Try and get a whiff of her Song of Songs. Ayala has long been on my radar and you’ve now convinced me with your beautiful reviews! Ayala’s samples will definitely be my first post-Christmas fragrance order. 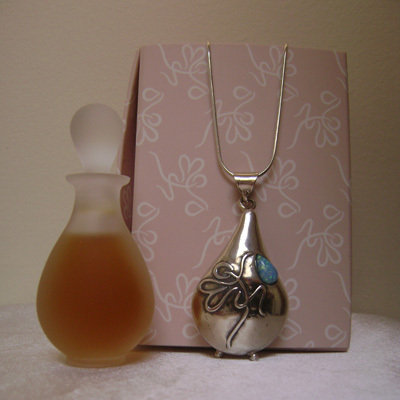 And another indie perfumer that I recommend highly is Laurie Erickson’s Sonoma Scent Studio. Her Champagne de Bois is one of my top five fragrances. I forgot about Laurie and Andy Tauer!! I knew I was going to do that! I’ve sampled many of Laurie’s scents, and there are a few still in my collection. If you don’t already, you should also know about Jessica September Buchanan of 1000 Flowers, also from B.C., I believe. Her first perfume is Reglisse Noire – ethereal, complex, and yes, licorice. She’s already working on another. You can google her, of course, to read her blog, etc. or cafleurbon had an interesting post about her fairly recently, too. I’m not affiliated, just thought you might be interested! Have a great day. Oops – wish we could just go back and edit – that should be cafleurebon! LOL, Debby! She’s next on my list! Just wanted to add my two cents. I won one of the 5ml giveaways of Reglisse Noir at Cafleurebon, and there is DEFINITELY a full bottle of that in my future. Beautiful, and unlike anything else I’ve smelled thus far. I will have to follow here too! I like the descriptions, and Cabaret as well as Bon Zai seem to me very likable. And to discover the other scents must be a great trip. way to sample but I may have to break down! Another vote for Sonoma Scent Studios here as well, her Tabac Aurea is simply gorgeous – and it lasts.. Yes – Tabac Aurea is wonderful. Espionage sounds lovely! I have tiny little samps of some of her early offerings – will have to revisit. I remember liking a lot of her stuff a lot! In any case, like Ayala her work is distinctive and very lovely! Oooooh! Isn’t the world wonderful? A whole bunch of things I’ve never tried … :d/ I want to try that Immortelle one. Bois d’Hiver sounds so wonderful as is Finjan! I am with Karin above. The price of the samples is so out of the reach of we ordinary mortals that I won’t even visit Moriel’s website again — too tempting and too depressing! Someone sent me a sample of Finjan the other day, which is lovely. Though, as a number of posters have said, naturals don’t seem to last well on me. This one disappears within half an hour. Her carnation soliflore, InCarnation, which I also like, lasts a bit longer but certainly not more than an hour or two. Hi Nava, Check out http://www.budparfums.com.au. 5 x 2ml samples of the perfume by the Australian perfumer for $10.(AUD). Maybe you could do a story on his wonderful creations. Cheers, Mouse. I’m with Karin and Mariekel on the price point – naturals don’t tend to stick around on me, either (exception tuberose; Vamp a NY that Erin reviewed over at NST today stays for houurrrrrs, and I love that), so the per-wear cost just kills me. Reviews of Ayala’s scents tend to be very positive, and I’m glad she’s producing lovely things.